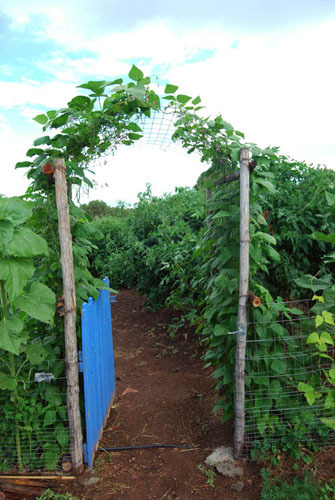 Here is a picture of the garden arbor in my entrance to the veggie garden. 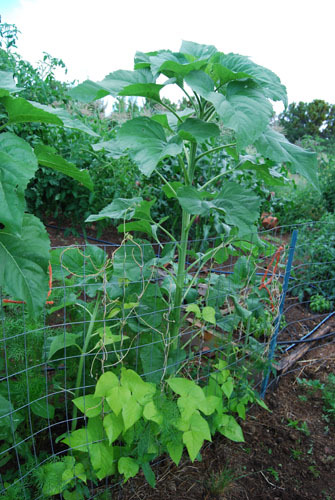 The ‘Rattlesnake’ beans, a pole variety that can grow 13 feet a season, are doing really well covering the arbor-just like I envisioned when I built it at the beginning of the season. An added bonus is they taste great. You only have to pick the beans before they get too big and tough. 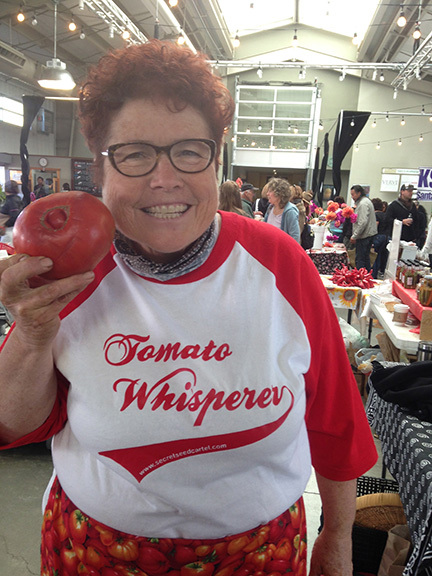 I ate some raw right out of the garden and they have a nutty sweet flavor that I like better than the ‘Contender’ bush beans that are just finishing up. Rattlesnake beans are a winner! Also pictured to the right of the arbor are chartreuse colored ‘Golden Sunshine’ Scarlet Runner beans I got from Cook’s Garden growing on the fence. They come from England. I love their bright yellow green leaves against the other greens. I grow them just because they are so beautiful and I love that purple varigated color of the seeds when they are dried. They haven’t flowered yet as they are just climbing the fence but when they do, the bright red blossoms will look great against that yellow-green. Behind the Scarlet runner beans, still on the right side of the entrance are my giant ‘Titan’ sunflowers that will be fantastic a little later when they get their huge flowers. They will grow up to 10 feet tall and have heads that can get up to 24 inches wide! 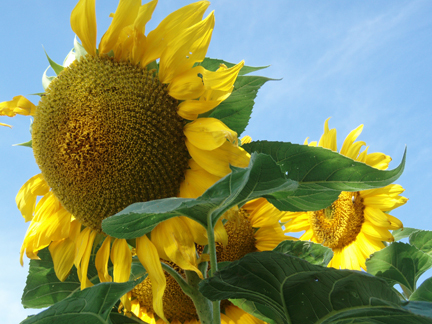 I call all sunflowers the guardian angels of the garden. 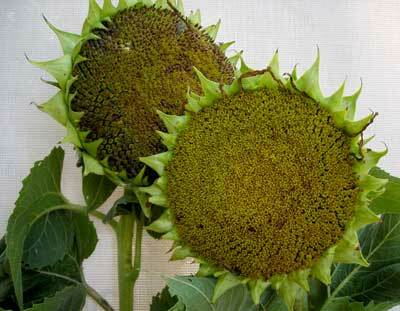 Did you know sunflower flower heads follow the sun all day long? Sun worshipers! Hence their name. They are so majestic! Behind them are various flowers that will be blooming soon to add color and attract beneficial insects. On the left side just inside the entrance, are asparagus fronds, calendula, ”Bright Lights’ chard, ‘Chianti’ sunflowers, multicolor ‘Japonica’ corn from Seedsavers Exchange and other flowers coming along. I got a late start in this section of the garden but it should look great later this month and I will take more pictures then. 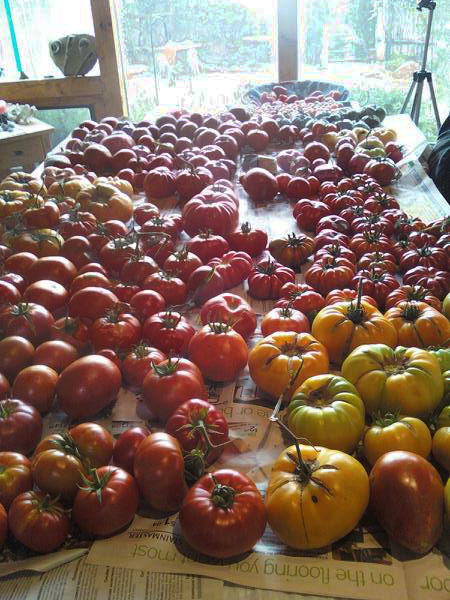 This year I want a beautiful garden as well as a bountiful one. I planted tons of flowers in the entry way and along the entry fence. Inside the entry fence I planted Titan sunflowers again (I call these the ‘guardian angels’ of the garden) which will grow behind some scarlet runner beans (good hummingbird attractors) that will grow up the fence. 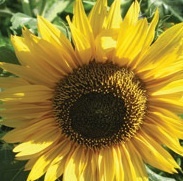 Last year the Titan sunflowers got 10 feet tall and heads up to 18 inches across. Then in the entry arbor I planted rattlesnake beans (a green and purple streaked pole bean) that hopefully will grow all over the arbor giving me a very lush, green entryway (and tasty one too). Then after you walk through the arbor immediately on the left, I’m going to try amaranth-Loves-Lies-Bleeding and cockscomb-Flamingo Feather. I saw these on the Seed of Change garden tour last fall here in NM and they looked fantastic, so I thought I’d try some. 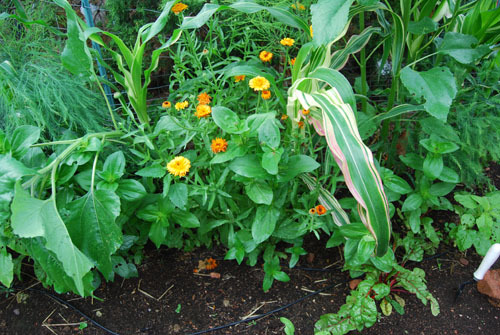 I also planted sunflowers-Goldie and Chianti, Queen Anne’s Lace, Zinnias and Cosmos flowers. All this with the asparagus that I had planted last year in the entryway. I figure I have a few years till the asparagus kicks in-so I’ll plant pretty stuff around it till it does. I am also putting a glass water basin for the birds in this section of the garden. Last year it was a nice entry and I hope it will be even better this year with the arbor and the flowers. Hope to have some good pictures later in the season. Ah, fantasies of how it might be.. 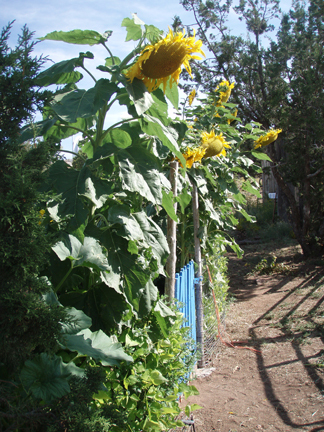 I just realize it looks like from the photos so far that I only grow giant pumpkins so I want to show you some titan sunflowers which got 10 feet tall last year. Really beautiful. Can’t wait to grow them again this year. The birds love them too. I call them the guardian angels of the garden.